In the comments thread, a question has come up about the originally proposed alignment of the SLRT. 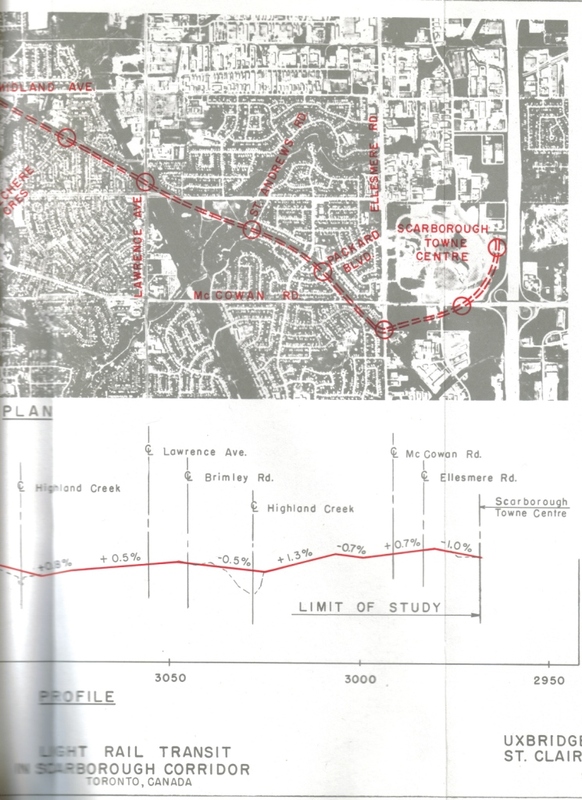 This dates back to the Metropolitan Toronto Transportation Plan Review (MTTPR) and a study of alternatives to the Scarborough Expressway. 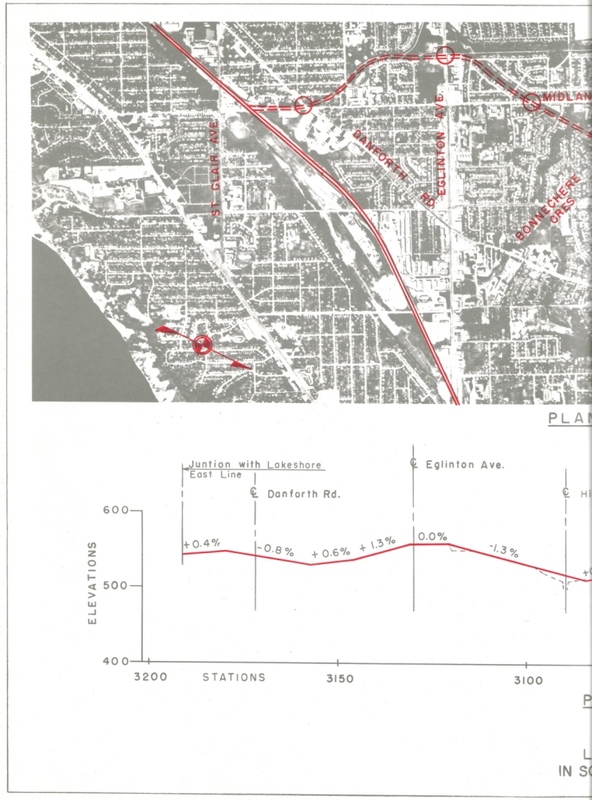 One of these was an LRT line starting at roughly Queen & McCaul running east to the CNR Kingston Sub at Degrassi St., then northeast via the CN to Morningside Avenue. A branch would run north from Scarborough Junction following mainly existing and abandoned rail corridors to the Scarborough Town Centre. That branch eventually became the SRT, but was moved to follow the Uxbridge Subdivision because the old right-of-way used in the first proposal was very narrow. As you will see from the maps, this is not the very wide Hydro corridor that crosses the SRT line, but a much tighter route. To orient yourself, the Uxbridge Subdivision runs just below the top edge of these maps which have north to the right. Item SC 28.30, which requests the TTC and Metrolinx to report in November 2009 on an LRT implementation for the SRT, was passed today by Council. Item SC28.20 was ruled out of order and withdrawn. TTC now feels that LRT is the appropriate technology for the route and is working with Metrolinx to define the technology and scope for the Transit City projects generally. The funding announced by Queen’s Park is not sufficient to carry the SRT north from Sheppard to Malvern. The debate will continue this afternoon, but I suspect the items listed in my original post below will not be dealt with until tomorrow given their place on the agenda. Toronto Council’s agenda today, September 30, includes items of interest regarding the Scarborough RT (SRT) line.